Pellagra | Infonet Biovision Home. 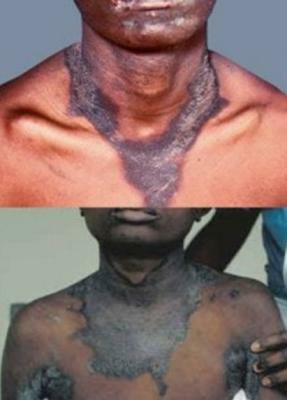 Pellagra is the late stage of severe niacin deficiency. Niacin, or vitamin B-3, a water-soluble vitamin. Pellagra is a disease caused by deficiency of niacin (one of the B complex vitamins) or tryptophan (an amino acid). An amino acid is a building block for proteins. Pellagra is defined by the systemic disease resulting from niacin deficiency, and it is characterized by diarrhoea, dermatitis, dementia, and death, which usually appear in this order. GI tract symptoms always precede dermatitis, or, "Pellagra begins in the stomach". The full tetrad of symptoms is usually not well developed in infants and children. Pellagra is observed in malnourished individuals and as a complication of isoniazid therapy; however, the diagnosis is often overlooked or delayed, occasionally with life-threatening consequences. A rash on the front of the neck (Casal's necklace). A rash (dermatitis) which is on both sides of the body, and on skin normally exposed to sunlight is a sign of pellagra. Check the face, neck, hands, arms and legs. Clinical evidence of pellagra develops 50-60 days after starting a niacin-deficient diet. Early symptoms include diminished appetite, weight loss and weakness. Aggressive Vitamin B complex supplementation. To prevent and/or treat pellagra, prescribe a protein-rich diet with adequate calories. The addition of meats, milk, peanuts, leafy green vegetables, whole or enriched grains, and brewer's dry yeast can enhance niacin intake. In patients with oral dysphagia secondary to glossitis, a liquid or a semisolid diet may be required. The long-term inclusion of milk, meat, and eggs in the diet ensures the dietary adequacy of the proteins essential for recovery. Bed rest is mandatory in treating patients with severe pellagra. Patients should avoid sun exposure during the active phase of the disease. The primary prevention of pellagra involves an adequate diet. Food sources of niacin and/or tryptophan include nutritional yeast, eggs, bran, peanuts, meat, poultry, fish with red meat, cereals (especially fortified cereals), legumes, and seeds. The recommended daily allowance of niacin for infants is 5-6 mg; for children, 9-13 mg; for adults, 13-20 mg; for pregnant women, 17 mg; and for breastfeeding women, 20 mg.
Optimal supplementation is 20-30 mg daily. Patients should avoid sun exposure during the active phase of the disease. Patients should follow a convenient dietary regimen. Close dietary follow-up after the patient's recovery helps prevent the recurrence of pellagra. Dermatitis of pellagra can be distressing and disfiguring. Denudation of the vesiculated and blistered skin lesions can potentially become infected secondarily. Severe glossitis causes dysphagia. GI tract involvement leads to a mal-absorptive state. Depression, anxiety, delusions, hallucinations, and coma are the neuropsychiatric complications observed in patients with pellagra. The malnourished state associated with pellagra results in death if untreated. How much niacin do you need? *A 3-ounce serving of meat is about the size of a deck of cards. Hegyi J, Schwartz RA, Hegyi V. Pellagra: dermatitis, dementia, and diarrhea. INT J DERMATOL. Jan (2004). 43(1):1-5. Rajakumar K. Pellagra in the United States: a historical perspective. SOUTH MED J. Mar (2000) ;93(3):272-7. Rille JH. Medizinische Gesellchaft Leipzig. Sitzug vom 16. November (1926). Ueber Pellegra (mit Lichtbildern). DERMATOL WOCHENSCHRIFT. 1927;6:189.